Water Recycling Systems from Transport Wash Systems. Today’s clean water is tomorrow’s gold. These water recycling systems make a meaningful contribution to reducing freshwater consumption and ensuring there is more of this precious resource to go round. With a huge chunk of the world’s population going without access to clean drinking water, it is our responsibility to use what we have wisely. Our kids will be dealing with the messes we make. Which is why all the systems that Transport Wash Systems supply have a water recycling option. InterClean are the designers of the patented “EQ unit” filter-less water recycling unit. The system uses centrifugal force to remove contaminants in wash water. 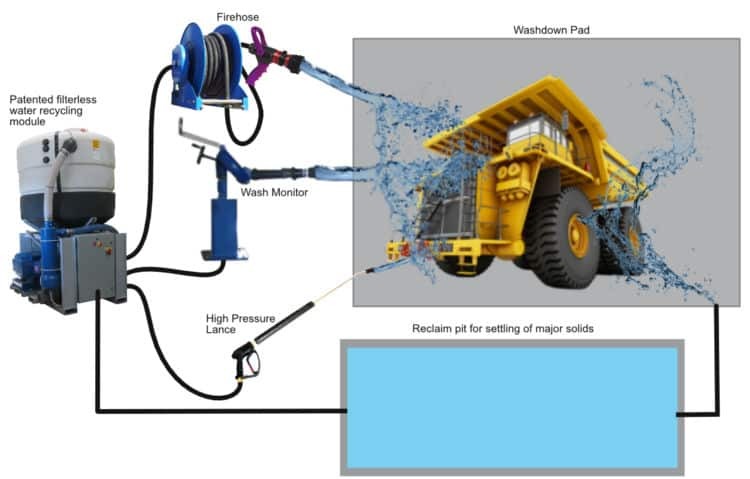 A highly sought after component in the heavy vehicle wash industry, its clever design means it can remove contaminants from large volumes of water without needing any replaceable media like filters – keeping maintenance to a minimum. Recycling water isn’t just the right thing to do, it makes economic sense as well. It is worth simply investigating a heavy vehicle wash system for this reason; if not for your wallet’s sake, for the sake of future generations. Employing time-proven methods and technology to clean water so it can be used again and again, the methodologies that Transport Wash Systems apply make the most of this precious resource with minimal maintenance and ongoing costs. The goal of the sedimentation process is to deliver clean and optically clear water for every wash. 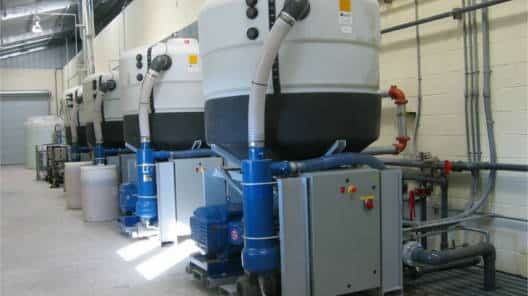 This cyclical use of water means leveraging passive techniques like reclaim pits, flocculants and filterless particulate extraction to make the water recycling system a hassle-free robust component of any wash system. Anyone can supply you with some form of water recycling, the important question to ask is the lifetime cost of that system. How often will filters block? What is the design life? We have optimised all the systems we deal with so that consumables and maintenance costs are absolutely minimised, filters are not used, reliability is industry standard and design life is always 10 years +. If you want minimum lifetime cost on your water recycling system, talk to us. If making your business more sustainable, cost effective and efficient is important to you then the capacity to recycle and maximise a precious resource like water is only going to become more important.